This article is about the TCG Booster Pack. For the OCG Booster Pack, see Deck Build Pack: Infinity Chasers. 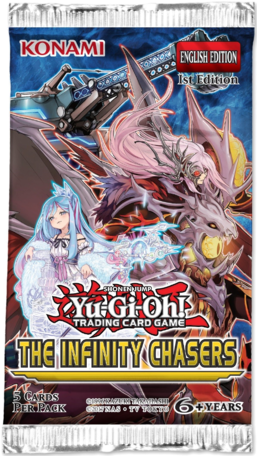 The Infinity Chasers is a Booster Pack in the Yu-Gi-Oh! Trading Card Game (TCG). Introduces the "Infinitrack", "Witchcrafter", and "Evil Eye" archetypes to the TCG. This page was last edited on 22 March 2019, at 13:08.